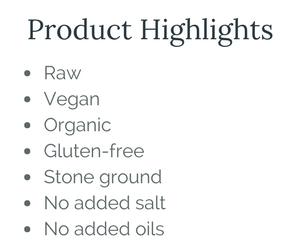 Rawmio is truly an artisan product. Every step in the process involves people connected to their craft. From the small farmers growing the ingredients sourced around the world, to the chocolate craftsmen who make Rawmio in small batches, each step in the process is thoughtfully considered to provide you with the best chocolate hazelnut spread in the world. Simply Put Rawmio is a work of edible art in jar. Rawmio is a decadent hand crafted raw vegan treat that will satisfy your sweet tooth. We combine both fresh and soaked/dehydrated organic hazelnuts and stone-grind them with organic cacao nibs and coconut crystals for a wickedly delicious, smooth dark chocolate spread we know you will devour. Organic raw fresh and soaked/dehydrated hazelnuts, organic raw cacao nibs, raw coconut sugar. Instant hot chocolate! - Simply add 1 heaping tablespoon of Rawtella to 1 cup hot water. Stir well and enjoy!